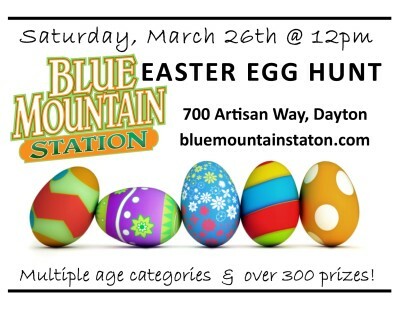 Join us for our third annual Easter Egg Hunt at the Blue Mountain Station. This year you can expect multiple age categories with over 300 prizes. Tickets found in the eggs are redeemable for food and gift items like organic hot chocolate, organic kettle corn, Mary’s candies, non-food Easter gifts. In addition, there will be vendors such as Granny’s Tamales, Zonia Dedloff, Wood Therapy Creations and the Dayton Girl Scouts. As always, there will be delicious food in the Artisan Market. Visit the other BMS tenant spaces to see what special offers and promotions they may offer.